Blank Notched Dog Tags customized the way you want them. 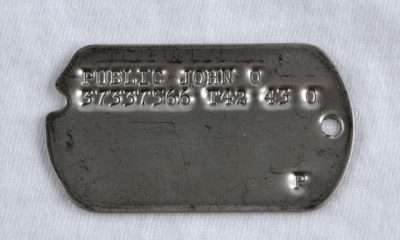 Dog Tags are used for all kinds of things such as ID, contact info, parties, travel, business promotions, school trips, teams. Feel free to put anything you want on the tags up to 17 characters per line including spaces. Perfect!! Exactly as I remember my fathers dog tags. I have returned time and time again. Always fast to ship and the tags are always perfect. Thank you so much! I could not be happier with my experience!! Awesome. We decided to use them as actual dog tags for our dogs… The best part is that when they die my partner and I will each have a dog tag to remember them by! No disrespect meant towards anyone by our choice of use. I couldn’t ask for better. The tags are great quality and Lance sent an original beaded chain in appreciation of customer loyalty. They care about those who patron their business and take notice. 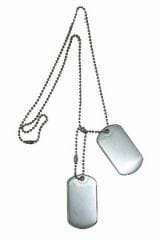 Wwiidogtags is the only place to come to for you dog tag needs and more. Absolutely fantastic. I love my dog tags so much, words can’t convey how happy I am with them. I had to have the bullet clasp of my original chain opened by professional jewelers so it could close, but that doesn’t change how pleased I am with my tags. Lance did a great job with them, and I couldn’t ask for better. Hi quality dog tags!! 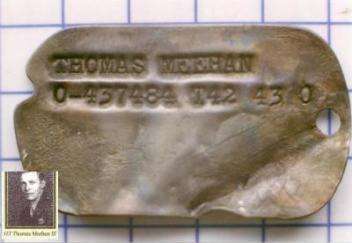 I purchased a set for my 13 year old son to be a resemble my issued dog tags with his Great Grandfathers WWII service number. I highly recommend the WWII chain!! I can not tell you how many dog tags I lost because the beaded chain unlatching. Well worth the money!! Love them it it perfect to what they would have looked like. Amazing! Quick! Friendly! 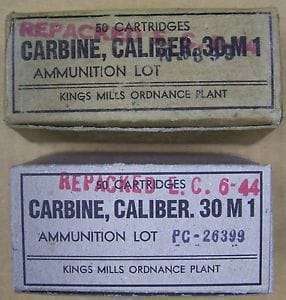 Would use them again and again!! The quality of the product is Top Notch! I can’t express how happy I am with the dogtags and how envious is everybody else in my reenacment group! It was an internationall shipment and it had its troubles, but none of them were Lance’s and he was always very attentive to every step of the way, made 110%. The product was great but the service was awesome! Will never hesitate in doing bussiness with him again, I fact I wish he sold everything so I could only do bussiness with him! The dog tags look great. Recieved them really fast. Great company. I would recommend them to anyone. Excellent experience. The best set of tags since I was in the military. They were just as ordered with perfect spacing, and printed on the correct side. Will be ordering from this site again in the future. Love them, only one on base with them which is cool! Showed up super fast and am super happy with them. Will be coming back. My father, brother and myself served in the Navy across three wars. We lost Dad 10 years ago and sadly, my brother died a year ago. He gave me his service memorabilia including his dog tags. Now that I have the replica of Dads, I wear all three of our tags. My way remembering them and their service every day. Thanks! 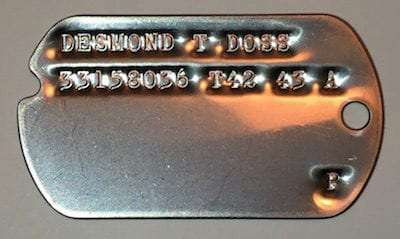 WWII dog tags is awesome and I really like the fact that I can put whatever information I want on the custom dog tags when ordering WWII dog tags…. the thing about the customer service is very awesome and the prices are very reasonable and I will defiantly recommend WWII dog tags to my friends and family because Lance is very nice and helpful. The awesome thing about Lance is that he’s quick to respond and the customer service is very awesome. Well made. My 9 year old loved it! My 15yo, WWII history buff, cousin loved them so much. I am officially the cool cousin. Very impressed with the clarity and quality. Just like the pair I used to wear.